The Pinion gearbox and the Gates Carbon Drive System is a new internal, chainless, derailleur-free technology that allows you to cycle quietly, with extreme power, while performing almost no regular maintenance to your bicycle. Internal gearboxes and bicycles driven by sprockets and belts instead of metal chains and derailleurs are still relatively new to the cycling world, so it’s no surprise that there are a lot of questions about how this new technology works, how much it costs, and whether it’s worth the risk of trying. That’s why, in this article, you are going to get the answers to 50 of the most common questions people ask about Pinion gearboxes and the Gates Carbon Drive System. What are the advantages and disadvantages to this internal gearing and belt-driven system? What kinds of bicycles is this system being used on? How does the Pinion gearbox compare to the Rohloff system or the traditional metal chain and derailleur system so many people are used to? How much extra weight, if any, does it add to your bicycle if you use a Pinion gearbox? Does friction from the belt mean it requires more effort to pedal than a traditional metal chain? Is it possible for the belt to come off or derail while you are riding? Will long-term exposure to the sun, rain or snow damage the belt or gearbox in any way? How long does the belt and gearbox last? Will it wear out after a certain number of miles or kilometers? Can you shift more than one gear at a time? And do you have to be pedaling in order to change gears? What kind of maintenance, if any, do you have to perform to the gearbox and the belt? How does the gearbox keep out potential contaminants like dirt and water? If the gearbox does need to be fixed or maintained for some reason, how exactly is that done? Where can I get spare parts for the Pinion gearbox and/or the Gates Carbon Drive System? Will my local bike shop be able to help me repair or maintain this unique bicycle technology? Or do I have to ship my entire bicycle to Pinion/Gates in order to get it repaired/maintained? Should you use a bicycle with this system installed on it only for domestic bike trips? Or can it safely and reliably be used in foreign parts of the world? How much does a Pinion gearbox with the Gates Carbon Drive System cost? And finally, is it worth the added price? To answer these questions, I sat down and spoke with Marc Seeman, the Program Lead at Pinion North America and the Gates Corporation. Listen to my audio interview with Marc Seeman from Pinion/Gates by pressing play on the media player above (or download the interview from Soundcloud). Then, read through the questions and answers below. What exactly is the Pinion gearbox and the Gates Carbon Drive System? Pinion is an internal shifting system for your bicycle that allows a tremendous range of gearing sealed inside a case for minimal maintenance. 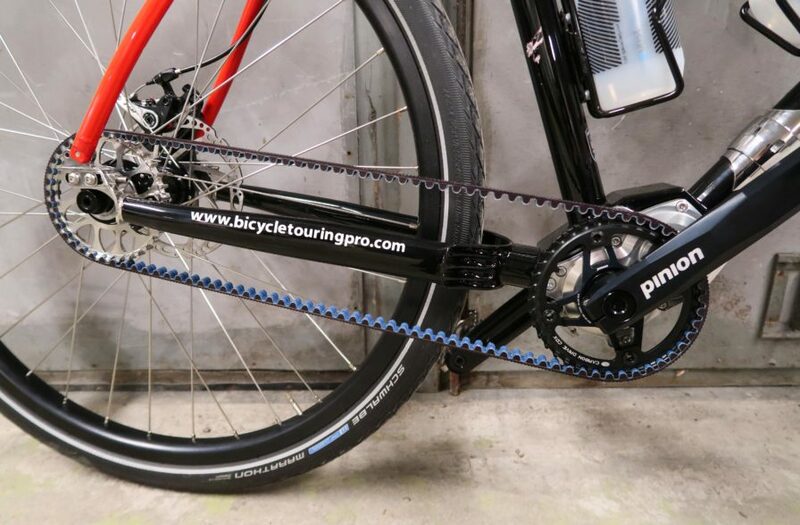 Carbon Drive is a belt drive system for your bicycle that replaces the conventional metal chain and sprocket. What is the problem the Pinion/Gates system solves? What are the advantages to a system like this? We’ve had the derailleur for a long time and we’ve gotten great at working around it’s shortcomings, but it still wears out very quickly and is not very durable. It has a lot of idiosyncrasies for shifting and is not very intuitive for new riders. Gearboxes and belts, on the other-hand, are low-maintenance, super durable, and last a very long time. What are the disadvantages, if any, to riding a bike with the Gates Carbon Drive System installed on it? These systems are a larger initial investment and you have fewer bike models to choose from currently. Do I have to have a special bicycle for this gearbox to be installed? Or can I have it installed on any of my old/existing bicycles? Yes, if you chose to use a Pinion gearbox or a Gates Carbon Drive System, you are going to need a bicycle with a specially-built frame. It is possible to retrofit a Pinion gearbox and Gates Carbon Drive belt and sprockets onto an existing bicycle, but it’s pretty difficult and expensive. It is easier to start with a Pinion-specific bike. What kind of bikes is this system being used on? We see the Pinion gearboxes and Gates Carbon Drive Systems being used primarily on touring, bikepacking and urban bikes, but there is a lot of interest in the mountain biking (especially gravity), gravel and cross worlds as well. Which bicycle manufacturers are using the Pinion/Gates systems? There are many brands using Pinion gearboxes and Gates Carbon Drive Systems in Europe, but our sales and service network is just beginning in the United States, so most brands using it are smaller factories with a lot of flexibility or independent frame builders (such as Co-Motion Cycles). I think there were about 20 Pinion bikes at the North American handmade bike show this year (2017), so that crowd has really jumped on it. How does the Gates Carbon Drive System compare to the Rohloff hub? They are very similar in some ways and completely different in others. Both have similar life expectancy and maintenance schedules, but Rohloff has the advantage of working in any existing frame, whereas the Pinion has to have a frame made specifically for it. 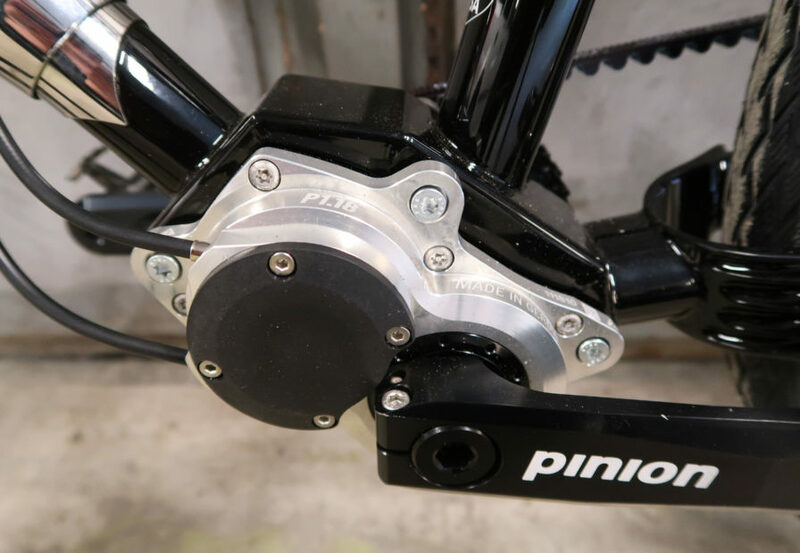 The Pinion has several advantages though in that the weight is in the middle of the bike (instead of in the rear) and offers different gearing configurations for different applications. Plus, the handling is much better on the Pinion, which is especially good for mountain biking. How much does the system cost vs. a high-end chain and derailleur setup? On Co-Motion’s bikes, for example, the Pinion and belt drive is between a $1,000 and $1,500 USD upgrade from an Ultegra double, but that price also includes a few other upgrades like I9 hubs. For Sram XO or level mountain 1X or 2X systems, the Pinion can actually be a little less expensive over a two or three year period when you factor in replacement chains and cassettes. How much extra weight does it add to a bike if you decide to have this drive system installed? Is there a weight limit that the Pinion gearbox can ultimately push or carry? Pinion has tested the box to more than 250nm of input torque, so they are extremely tough. I have never seen any kind of weight limit. 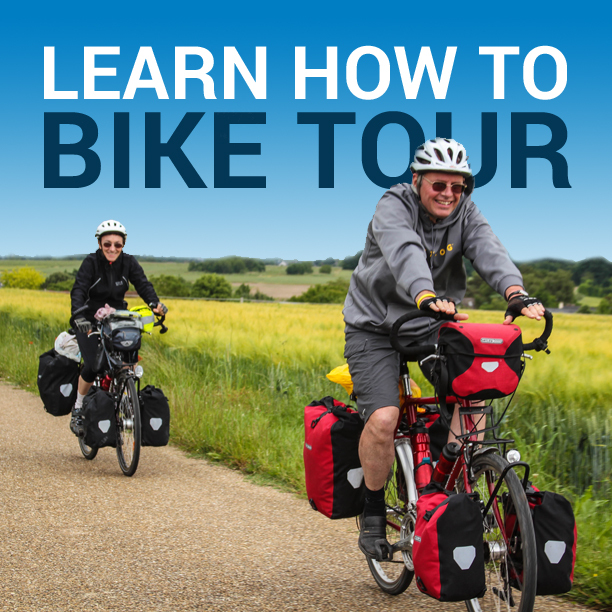 When it comes to bicycle touring, the three most popular ways to carry your gear on your bike are with the use of panniers, a trailer or a set of frame/handlebar/seat packs. Will this system prevent you from using any of these three methods of carrying gear? A handlebar bag may require some special routing of the shift cables, but otherwise… no, the Pinion and Carbon Drive system will not interfere with any traditional bike touring or bikepacking bags, racks or packs. Does the belt require any lubrication? No. The belt and sprockets do not require any type of lubrication – ever. Does it have any power loss due to elasticity in the belt? No. The Carbon Drive belts have extremely high tensile strength (the stiffness of the chain or belt). There is less flex or stretch in the belt than a chain. I think a lot of people think of cheap rubber belts or v belts when they think of this and you will find that there is a tremendous spectrum of quality and performance for belts. We are using technology from the extreme high end of that spectrum (carbon tensile cords, polyurethane construction, etc., so there is no elasticity or power loss in the belts. We have found in our bicycle and industrial power transmission efficiency studies that the chain is more efficient when there is very little power being transmitted through the drive. As the power increases, the chain loses efficiency much faster than a belt. This means that under any medium to hard effort on the bike, the belt is more efficient. We are talking about tiny amounts of loss / gain here, which have never been discernible to me and will likely be indiscernible to most riders. Letting a few pounds of pressure out of your tire would be a much bigger change to the bike’s overall efficiency. How exactly do you mount the belt to the bicycle? A metal chain breaks apart and can be wrapped through the chain-stays on the back of the bicycle frame, but how exactly is the belt looped through that real part of the bike frame? The frame must have a split in it and a tension mechanism for the belt. This is what allows you to wrap the belt through the rear triangle of the frame. This depends on the design of the frame. If you have a sliding dropout or an eccentric bottom bracket you can use a standard vertical dropout in which there is no difference from a conventional bike. When the wheel is re-installed the tension will be exactly the same. If you have a bike with a horizontal dropout and a chain tug to adjust the tension you will have to release the tension, remove the belt and then pull off the wheel. It’s a few extra minutes of work. How do I get the belt at the correct tension? Is that something that’s simply built into the bicycle? Or do I have to adjust the tension myself? Tension is crucial for the belt – most frames use a sliding dropout or an eccentric bb which are easy to adjust. You can use one of the Gates tools or our free phone app that works like a guitar tuner to measure tension. I heard somewhere that “so much tension is required of the belt it can put a lot more stress on the rear hub bearings than traditional chain/derailleur systems.” Is that the case? On Gates’s first bicycle belt drive system, a higher tension was required to prevent derailments which put more stress on the hub and bb bearings. This usually was an issue on bikes with extreme misalignment of the sprockets. Our current CDX and CDN systems use a patented center track design that allows for much lower tensions without the risk of derailments, even if the alignment is poor. If your frame, sprockets, crank or hub are damaged (causing a loss of tension), it could lead to a derailment. However, as long as everything is in good adjustment and not broken, you should never experience a derailment. Will long-term exposure to the sun, rain or snow damage the belt? The CDX belts are built for any conditions. UV, moisture and temperature (up to 180 degrees and down to -86 degrees) will not damage the belt. Does the belt stretch out over time? The belt will not stretch, but the teeth of the belt and the sprockets will wear away over time. If you look at the belt periodically you will see it begin to crack at the base of the teeth, which means it’s time for a new belt. I noticed a small hum occasionally coming from the belt when I was in a higher gear and/or really pushing the bike hard. Is that normal? If there is a misalignment under heavy loads or frame flex causing a misalignment the belts can produce a sound. This is very out of the ordinary on a bicycle built specifically for the belt and Pinion. I noticed a small amount of wear or peeling on the inside of the belt after my 2,000 kilometer bike tour. Is this normal? The blue part of the belt is a polyethylene coating that helps during the manufacturing process. It will usually wear away in the first thousand miles. The Nylon jacket underneath the polyethylene is what protects the polyurethane and reduces friction. How long does the belt last? Will it wear out after a certain number of miles/kilometers? Gates generally says you can expect the belts to last 2-3 times what you would expect for a chain in the same conditions. For some people this means 30,000 miles (50,000 kilometers), for others it might mean 6,000 miles (10,000 kilometers). Should I carry an extra belt with me on my bike rides/tours – just in case my belt cracks or breaks? It depends on where you are headed in the world and what you might encounter along the way. For example, if you are planning to cycle through super rugged terrain in Africa, bring a spare belt. But if you’re just planning a gentle cruise through the Pacific Northwest, you’re definitely good with only one belt. How much noise does the Pinion gearbox and Gates Carbon Drive make, if any? The belt should be extremely quiet. If you do hearing a humming sound, this usually indicates a misalignment of the belt and/or sprockets. What is shifting the bike like with this system in place? How exactly does that work? The shifting is super fast and intuitive. You can shift while standing still or pedaling lightly, but not under full power. Can you shift more than 1 gear at a time? Yes. You can shift multiple gears at one time – with or without pedaling. What kind of a shifter are you using? Where is the shifter on the bike? And how exactly does it work? Pinion uses a rotary shifter on the handlebars to change gears. Simply turn the dial on the shifter to change to the gear you desire. It’s very easy to use. Is it possible the system will use a different type of shifter in the future? Do you have to be pedaling to shift gears? Or are you supposed to shift gears when you are not cycling? Either way works – pedaling or not. You do need to reduce the load on the pedal during shifts, which takes some getting used to, but it is simple timing and coordination. I personally found that it was very easy to shift up gears (say from gear 6 to 7) while I was cycling, but found it more difficult to switch down gears (from gear 7 to 6) and would usually have to stop cycling for an instance, shift gears, and then continue cycling. What is happening inside the gearbox that is causing this to occur? And is there anything I can do to make the downshift easier? There are expanding pawls that engage and disengage the gear pairs inside the Pinion gearbox, so when shifting down there must be little to no load on the pedals for the pawls to retract away from the sprocket. Once again, this just takes a little bit of practice, but most people are able to figure this out within a day or two of owning a Pinion gearbox. Does riding the bike with a heavy load make a difference in how the gearbox performs? No. The Pinion gearbox should be stout enough for any heavy touring application. How does the Gates Carbon Drive System perform in the rain, snow, mud, dirt, etc? The Pinion gearbox and the Gates Carbon Drive usually perform very well if everything is adjusted correctly. With very low tension mud can cause the belt to derail, but at the correct tension the mud-ports built into the sprocket allow the mud and snow to be pushed out between the teeth by the tension of the belt. Because of the placement of the shifter on the handlebars, does that rule out this system from ever being used in a competitive/race environment? For racing applications that use flat bars, the existing design works very well. For drop bar racing, however, we still have some work to do. How difficult is the Pinion gearbox and Gates Carbon Drive System to get used to? If you are brand new to cycling it is very easy and intuitive, so you can just jump on and go. For someone who has mastered shifting a derailleur bike there is a bit of adjustment required to the timing of your shifts. Once you have the coordination down you can begin focusing on the advantages of gearbox shifting – shifting while sitting still, shifting mid corner without the risk of a pedal strike, shifting while braking etc. What kind of maintenance, if any, do you have to do to maintenance the gearbox and the belt? The gearbox requires an oil change every 10,000km or once a year – it takes about 5 minutes. The belt drive does not need any maintenance, though cleaning it regularly helps its longevity. Because the bicycle’s frame is built differently to accommodate the Pinion gearbox, does that increase the likelihood that the frame of the bike might crack or break? I have not heard of any frames breaking do to the Pinion gearbox. It is true, however, that since the gear reductions occur in the front, the load through the top span of chain or belt can be 2–3 times higher, so the frame must be built with these loads in mind. How does the gearbox keep out potential contaminants like dirt and water? Do I need to worry about the gearbox or belt getting wet or dirty? The sealing systems inside the Pinion gearbox are very similar to an automotive or motorcycle transmission – they use labyrinth seals that do a very good job of keeping water and grime out. I would say they are water resistant, but not waterproof – the same as a suspension fork or a hydraulic brake system and probably good enough for many stream crossings. If the gearbox does need to be fixed or maintained for some reason, how exactly is that done? Will I be able to perform the repair myself? Do I need special tools to maintain or repair the box myself? Where can you get spare parts, if necessary? Will my local bike shop be able to help me? Or do I have to ship my entire bicycle to you to be repaired? How does that work? Some routine maintenance (cables, oil etc…) can be done with normal bike tools, but anything that would require opening the box would mean a trip to Denver or Denkendorf. These products are more like the transmission in your car or motorcycle, so the service intervals are extremely long and should not require internal adjustments or maintenance. If I was in a super remote location and something were to go wrong with the gearbox, is there any way for me to repair it on my own? If your were to break a cable, you are still able to shift the gearbox using a 3mm Allen wrench. The cables are regular shift cables and easy to replace if you are out on a tour. If there is something more drastic like a sprocket breaking, you would need to have a lock ring tool and a sprocket wrench to remove the lock ring. You could bring these tools on tour with you, but it would be a bit like bringing a disc brake bleeding kit, a bottom bracket tool, crank puller, etc… – you probably won’t need them. I would feel confident riding a bicycle with the Pinion gearbox and Gates Carbon Drive System anywhere in the world. How much does it cost for a Pinion gearbox and Gates Carbon Drive belt system? The whole system would have an MSRP between $1,000 and $2,500 depending on the gearbox model and configuration. What is the difference in price between a bike with this system, a Rohloff hub, and a traditional metal chain and derailleur system? It depends on the configuration, but Pinion is generally competitive with Rohloff. For Co-Motion bikes, the Pinion is a $1,000 – $1,500 up-charge over an Ultegra level drivetrain. If I wanted to buy just a spare belt, how much would that cost? Is it ultimately worth the added price to buy a bicycle with a Pinion gearbox and Gates Carbon Drive? Not thinking about and fussing with your drivetrain is worth it to me! I would be curious to see what the costs look like after 5 years of ownership. How many cassettes and sprocket were purchased vs. belt and sprockets. We can say confidently that the final drive will last 2-3 times longer and when an XO1 Eagle chain and cassette cost $400, we are getting competitive very quickly! I have not heard of anyone going back. While the Internet might make some of the shifting idiosyncrasies and the weight of the gearbox sound like big issues, the fact of the matter is most people saying that haven’t actually ridden a bike fitted with a Pinion gearbox and a belt. Once you ride it and are familiar with it though, it’s tough to go back to chain and derailleur maintenance. The answers to these 50 common questions about Pinion gearboxes and the Gates Carbon Drive System were provided by Marc Seeman, the Program Lead at Pinion North America and the Gates Corporation. For more information on Pinion gearboxes and the Gates Carbon Drive, be sure to download and listen to this episode of the Bicycle Touring Pro podcast. If you have any additional questions about Pinion, Gates or the Co-Motion Cycles Siskiyou touring bicycle, please leave a comment below. This entry was posted in Bicycle Touring Pro Articles, Featured Articles, Featured How-To Articles, Main Articles, Main Featured Articles, Podcast, Product & Service Reviews, Products, Touring Bicycles, Uncategorized, Videos and tagged belted bicycle, bicycles with belts, bike builders, chain-free, chainless, frequently asked questions, gates, gates carbon belt, gates carbon drive system, gearing, internal gearing, marc seeman, no chain, pinion, pinion bike, pinion gearbox, pinion gearboxes, pinion internal gearboxes, pinion podcast, pinion touring bicycle, podcast, price for pinion, touring bicycle with pinion. I’ve listened to this recording in it’s entirety, and it’s really great with the details. Great information! I test rode a bike with a P1.12 transmission and Gates Carbon Drive and it was amazing how quiet it was compared to my Ultegra drivetrain. Shifting did take some getting used to, but I could see where with a day or two of riding and it would become second nature on timing the backing off of pedal pressure, just as it took some learning and adjusting when I started riding my road bike. One thing not covered in the above Q&A was the Q-factor (the distance between the faces of the crank arms where the pedals are installed. This was probably the biggest noticable difference between the Pinion and my Ultegra. The Pinion P-line (P1.18, P1.12, etc) have a Q-factor of 174 (mm) where the Ultegra is 146.6. 27.4mm is a huge difference in how far apart ones feet are. Some make like this better, others may discover new knee, hip and/or leg pains. I would be interested in hearing if Pinion has any plans to make a C1.18 as the C-line have a Q-factor of 166 (and lighter weight housing materials). Still wider than the Ultegra, but not as wide as the P-line. Thanks for posting this. My only question for now is about the gear ratios between front and rear sprockets, all bikes I’ve seen so far have very close ratios. In fact, in the Pinion website I read that the recommended ratio was .875 rear to front, which seems to be the case in the bikes I’ve seen and that to me sounds like a really low gearing. do you happen to know how this works? I feel like there’s something I’m missing here and any info on that will be appreciated! Good episode! Keep them coming. Hope someone is still looking at these comments :-). Just rode a pinion/gates combo and I have a question. I apparently have a habit of backpedaling a bit when coasting. Then when I start pedaling again, I get a kind of ‘bump’ that I feel through the pedals. Is this normal for this combo, or does it mean that something is misaligned or tensioned?